In Long Beach, middle school families have many choices for what high schools they can apply. These choices include almost 40 LBUSD school options, private schools, and one charter school, Intellectual Virtues Academy High School. It takes both knowledge and attention to make the appropriate choice for your child and we want to partner with our IVA families in making this decision. In this webpage we offer more information about Academy and LBUSD options. To see our Class of 2018's high school intent data click the link here. As you know, IVA is recognized for its research-based, intellectually challenging and supportive academic program. In the fall of 2016, the Academy began extending the intellectual virtues education model to the high school, equipping every student to think well: critically, creatively, and with a capacity for self-growth. The Academy invites you to learn more and experience the high school firsthand at one of the upcoming open house events or school tours, which are tracked on this link here. You can find valuable school information on the Academy website (www.academylongbeach.org). If you are interested in completing an application for the 2018-2019 school year, you may complete an online application here or you may request a paper copy of the application by calling the Academy front office at (562) 283-4456. Read a summary of instructions for applying to the academy here: Academy Process for Enrollment. Academy students are equipped with the knowledge, skills, and “habits of mind” needed for success in college, careers, and beyond! The Academy Team looks forward to getting to know your family as your child transitions into high school. There are 11 schools to choose from within LBUSD: 6 comprehensive high schools (Cabrillo, Jordan, Lakewood, Millikan, Poly, and Wilson) and 5 small, thematic high schools (CAMS, McBride, Renaissance, Sato, Browning). Comprehensive high schools typically have a large student population (2,500-4,000 students), offer a wide variety of classes, athletic team programs, and specialized/traditional small learning communities. Attendance boundaries also allow for residential priority, meaning students who apply to schools outside their neighborhood would be put further down the list for admission. Small thematic high schools tend to have smaller student populations (400-1,200 students), offer a limited menu of class options, and limited or no athletic team opportunities. Though this may be the case, there are no attendance boundaries, meaning students who live outside of the region can apply with no priority given to neighborhood families. We strongly encourage our 8th grade families to research thoroughly the right high school for your student. All students in LBUSD High Schools belong to a Small Learning Community or Secondary Specialized Program. For information on the selection methodology of these options, see the handouts at the bottom of this page. Most SLC's / Pathways integrate rigorous academic instruction with demanding technical proficiencies and field-based learning--all set in the context of one of California's 15 major industry sectors. Others focus on blending the rigorous academics with technical proficiencies common to all industry sectors. There are 16 options of SLCs at the six comprehensive high schools. See more on the LBUSD website. In these SLC's, there are no admission requirements. Residential priority is placed first* and remaining seats are assigned by lottery. *Residential priority is not guaranteed (Poly is a great example because there are more students in the residential neighborhood than spots at the school), but they are generally honored if a student selects a small learning community at their home high school first on the residential selection screen. Specialized programs can have competitive admissions processes, which is an option for each program. Some schools also require 8th grade Algebra I credit. Only specific schools require a STEM Index and/or a HSAI number as qualifying criteria (check the Qualifying Criteria within the 2018-19 8th grade Family Mailing Packet below to understand the requirements of the schools that interests you). Students are selected to these programs by rank, but if the programs are oversubscribed the program chooses the selection method. To learn more check the LBUSD website or the documents below. Central to IVA's mission to create an atmosphere that inspires growth in the personal qualities of excellent thinkers is a weekly, virtues-based Advisory, in which every student participates. Throughout the year, groups of around students meet with their assigned advisor, a trained adult mentor who creates opportunities for the practice of intellectual virtues. Curriculum developed for Advisory includes direct instruction in the nine master virtues, methods for self-assessing intellectual character growth, and the opportunity for each student to explore, in depth, a topic of specific and intrinsic interest to him or her. Devoting time to self-initiated study helps develop students’ natural curiosity, a master virtue, and gives students a practical way to grow in this capacity with their peers. We protect our Advisory hour in order to protect the development of students' curiosity. Moreover, Advisory offers a safe environment for students to discuss their personal development of intellectual character through the weekly check-ins and conversations. Students are guided to bring what they are curious about to the group for intellectual exploration and play. Advisors teach students how to creating a big how or why question, choose a Thinking Routine or protocol for exploring the question together, and choose a text, which can be a podcast, Ted Talk, video, article, or other reading selection. Practices like Advisories create, "... a dynamic group of people who feel that they are learning together and creating something greater than that which any individual might produce. It feels good to be a member of a culture of thinking...A culture of thinking produces the feelings, energy, and even joy that can propel learning forward and motivate us to do what at times can be hard, and challenging mental work." Families - try out one of our Family Advisories at home. We "assign" these optional and fun conversation guides occasionally over the holidays. The following examples aim at guiding families to explore what they are curious about together using an Advisory-type approach. Develop a culture of thinking together where you can reflect on and learn about ideas as well as how you approach learning. These conversations should be fun where intellectual exploration and play combine with the safety of a supportive environment that practices the types of values that IVA has adopted as an organization. Download the reference sheet that is provided to students and try out one of these Thinking Routines in your own conversations. Advisory groups, which meet 8:20 to 9:20 a.m. every Thursday, are one of the most important and distinct features of IVA students’ education. Check our our Advisory in a Minute video to catch a glimpse. The main purpose of the advisory groups is to further the personalization of IVA’s educational model by having weekly, in-depth check-ins with an adult mentor (the advisor). The overarching goal is for the advisors to get to know their advisees as thinkers and learners and to create opportunities for intellectual exploration and the practice of intellectual virtues. A curriculum developed for advisory groups will help form the texture of these groups. We anticipate that advisory groups will become a safe environment for students to discuss their personal development of intellectual character. Much of the success of IVA’s Advisory groups depend on securing Advisors who are committed to their own growth in our nine master virtues, who have some insight into the minds of middle school students, and who can foster meaningful conversation amongst the members of their group. Parent and community volunteers help provide adult role models of thinkers and learners at school that represent to our students a greater diversity of adult leaders than our small staff. Developmental theory suggests that middle school students are in a period of separation from primary adult caregivers (parents, etc.) but remain in dire need of meaningful interaction and emotional connection with adults. With that developmental tension in mind, advisory groups we have realized are one of the most important features of IVA students’ education. Ongoing Training: One Thursday every other month Advisors will meet after school for the hour after school gets out from 1:30pm-2:30pm for discussion and further training. Training “on the job”: The first four Advisory blocks of the upcoming school year will be conducted in a full school program introducing IVA Values and concepts that will be valuable for creating a safe culture of thinking such as growth mindset and kinds of listeners. Advisors will need to attend these meetings as they are an introduction to concepts and relationships we develop with students. All Advisors complete an application process, are tested for tuberculosis, and complete a Live Scan (Our office will make arrangements for all of this and the school will pay for the cost of the Live Scan). Using the process described above, our teachers also develop common instructional practices for student and teacher. Please review this document to learn more about our late work, make-up work, and similar policies. Please also click here to see the syllabi for each class to see the curriculum at a glance. Included below is a document that we provide to our students for their use in Advisory. This document can help explain the instructional protocols that all teachers utilize to help students make their thinking visible in class and to provide for differentiation and formative assessment during class as the teacher leads the students in a culture of thinking together towards a deep understanding of content. In his book Creating Cultures of Thinking, senior research associate, Ron Ritchhart describes a culture of thinking that these policies and practices create, "People often mention that in a culture of thinking , they feel committed to the learning of others and not just to their own. It is this commitment and the recognition of the symbiotic relationship between one's individual learning and that of other group members that help create a sense of community." To learn more about the educational philosophy behind these instructional practices see the books in our Resource Library. In order to focus on thinking and learning in all aspects of education at IVA we have changed the name of homework to home thinking. Some classes call it HoT for short. This name change helps remind teachers, students, and parents that the purpose and value of assignments at home is thinking. Home thinking is a great place to practice intellectual autonomy, a capacity for self-directed , since the students classmates and teacher are not there to support the learning. When parents are able to help, the document below can offer some questions to guide the thinking process. We hope this document can be useful for our parents! We want our students to have the opportunity to struggle through complex learning and feel the reward of figuring it out for themselves. We also provide resources for students. Our families can help equip your children by apprenticing them in organization and troubleshooting so that students know how to use the resources that teachers provide. This apprenticeship into self-advocacy and intellectual autonomy, to think and reason for oneself, is part of the foundations of a love of learning. To learn more about how to use resources at home see the following video and links to helpful handouts. Working together, IVA teachers created "Criteria for Marks" -- a guide for assigning letter grades while upholding IVA's mission to foster meaningful growth in intellectual virtues. This guide is also a resource for feedback language on benchmark, or summative, assignments and daily, or formative, assignments. We encourage our students to see struggle and challenge with a growth mindset -- in which they believe they have not learned it, yet -- and our grading rubrics are crucial to this approach. We also encourage students to live within the daily expectations of deadlines, so that they may practice the virtues of an attentive, intellectually careful, and intellectually thorough student. For more information on grading practices and to see the foundation document for our teachers' rubric creation, please review the document below. Fostering intellectual virtues is not an alternative to a rigorous, standards-based curriculum. On the contrary, it is through active and reflective engagement of core academic knowledge and skills that students learn to practice the intellectual virtues. In selecting IVA's curriculum, the school's founders and teachers searched for existing published curricula in core areas that (1) aligned with the Common Core State Standards, (2) aimed at deep understanding, and (3) provided opportunities for the practice of intellectual virtues. How is the writing process taught at IVA? We utilize a varied approach to teaching writing at IVA. As school we have not adopted any official writing curriculum. Throughout each unit students read a variety of texts, discuss them as a class, and eventually write about those texts. Although it may seem strange, the readings and conversations are in many ways the first steps of the writing process. As students get comfortable with the texts we are reading and develop their understanding of what the authors are saying, they are better situated to write about those texts. Each unit, teachers generally assign a quiz with a few questions about the current novel. Students are asked to write a few paragraphs using evidence from the text as they respond to the question. These responses are collected, graded, discussed allowing students to see one or two sample student essays, and then passed back to students. A similar process happens at the end of each unit. Students are generally asked to write an analytic essay with introduction, body, and conclusion responding to a specific question about the book. They are given tips on what to include in their introduction, body and conclusion, but they are necessarily assigned a specific outline for their essays. The hope is that as students continue to write, see other students' writing, reflect on their own writing, and ultimately rewrite (see below) portions of their essays they will gain an understanding of the elements of powerful essays. Two other elements of the writing process are staples in the Literature and Composition classroom: Timed Writes and Sentence Composing/Combining. Every three weeks (usually on Thursdays), students are presented with a quote or question and asked to write a mini in-class essay arguing a particular point (or thesis). We first look at a few articles, TedTalks, news stories, or other "sources" to collect evidence about that day's question or quote. After reading and discussing the "sources" students write a brief four paragraph essay in the last 15 minutes of class. These essays do have a suggested outline. Students are only graded for these timed in-class essays based on their participation. They only need to give a genuine effort and attempt to write for the full 15 minutes to receive full credit. The essays are placed in the students writing portfolios (kept in class). Toward the end of the semester, students will take one of these "Timed Writes" and, using their original essay as a rough draft, develop a full 4-6 paragraph essay. These essays are read carefully and graded for content. With regard to language development and grammar, our main source for exercises is Sentence Composing by Don Killgallon for 6th and 7th grade. 8th graders use a similar workbook called Sentence Combining by William Strong. Both of these books push students to create different types of sentences by studying effective models. Students are asked to look carefully at components of a sentence and create sentences of their own that are varied, creative, and powerful. These exercises are generally done once a week in class. About once a month one of these exercises will turn into a "quiz" in which students turn in their sentences and they are graded using a rubric. There are, of course, other elements of the writing process that take place in class, and in other classes as well, but hopefully the brief sketch outlined above will at least give families a small picture of some of things students are asked to do in class with regard to writing. How is writing graded at IVA? Writing at IVA is generally graded based on rubrics. While each teacher may vary the rubrics based on the particular assignment, in general each rubric measures students' content and ideas, word choice and syntax, and grammar and spelling. For a list of each rubric, see Illuminate or Google classroom for the given assignment. Handwritten responses, such as quizzes, are read carefully and given a grade based on the rubric. Specific comments and feedback are generally not given on handwritten responses (see below for more information on feedback). Typed responses, such as performance tasks and take home writing projects, are read carefully, given specific comments and feedback. Following these larger assignments, students are then asked to rewrite some aspect of their response taking in the teacher comments and feedback. It should be noted that although handwritten responses are generally not given specific teacher feedback, students are always welcome to bring their writing to office hours to get a better understanding of the areas they are doing well in and the areas for improvement with their writing. What is your process on giving students feedback on their writing? As noted above, handwritten responses such as quizzes are generally not given specific feedback. Specific feedback is reserved for larger assignments such as performance tasks and take home writing projects which are generally typed out using Google Docs and submitted on Google Classroom. There are several reasons for this decision regarding when feedback is given. One, students are asked to write A LOT throughout each unit. Providing specific feedback on every written assignment is unfortunately not always possible. Two, often the setup of paper documents can make it difficult for teachers to write exactly what they are trying to say. There may not be enough room on the page, or, if the page is somewhat messy or disorganized, the feedback can be confusing or unclear for students. Three, a good rule of thumb in education is to not provide students with specific feedback unless you are going to provide them with an opportunity to put that feedback into action immediately (i.e. rewriting). Each time specific feedback is given on performance tasks and take home projects, students are asked to rewrite and put that feedback to use. This helps students grow as writers. Retaking tests and quizzes is encouraged! In Literature and Composition as in many other classes, students have the option to rewrite. If a student so choses, she could rewrite the same essay or quiz response a dozen times to try to improve her score. The reason for this is the belief that rewriting is one of the best ways to grow as a writer (see above). The best writers will all acknowledge that their first draft of any project is rarely their final product. One common condition on this freedom to rewrite is that the rewriting of tests and quizzes needs to happen at school during office hours with teacher supervision. This condition is in place to ensure that the "testing environment" is secure and students are only relying on their own skills and knowledge to rewrite. How can I support my child at home with writing? There are a number of ways parents can support the writing process at home. The most important way is to encourage your child to read as much as possible. While reading and writing are by no means the same thing, the two processes are intimately connected, and generally speaking, students who read often have a decided advantage when it comes to writing. The performance task and quiz writing prompts will usually be posted on Google Classroom and Illuminate a few days before that actual test or quiz. You could encourage your child to look over the questions, make sure he understands what they are asking, prepare a few ideas of things he would like to write about in his response, and collect any quotes from the book that might strengthen his response. Quizzes and performance tasks are almost always open note and open book. Having ideas ahead of time can make the test or quiz day a bit more manageable. There are a few writing tutorials posted on Google Classroom in the Literature and Composition classes that provide students models of writing in addition to some general feedback and tips for strong writing. Within those classes you can view these videos by searching for the "Writing Tutorials" topic on Google Classroom. Students could view these videos at home, take note of a couple elements of good writing as well as the types of mistakes to try to avoid in their writing. Finally, a good way to support your child is by checking Illuminate on a regular basis to see how your child is doing. If you notice your child is missing a test, quiz, or project encourage him to come to office hours to make up or finish that assignment. Thanks to all of our families for their time and support! Please feel free to contact teachers by email or set up an appointment with additional questions. Our IVA teachers look forward to continuing to work with your child as they grow as writers! IVA's mathematics curriculum, Connected Math Project 3 (CMP3), presents students with robust and real-life problems – like deriving a formula for maximizing profit of a bike rental company. Students, not the textbook and not the teacher, do the high-level thinking about numbers and numerical relationships to come up with the problem's solution. Students are also challenged with a Problem of the Week, which sometimes takes more than one week to complete. A POW requires more sustained thinking to solve -- often, students won't find an answer the first day. To see a real-life example of a POW that have puzzled and mathematicians check out this quick article on NPR. For a slightly longer explanation of the sort of mathematical practices that these home thinking assignments encourage read this article on seeing math students as sense-makers rather than mistake-makers. A POW write-up includes five sections: problem statement, process, solution, extension, and self-reflection. POWs are an opportunity for students to not only find a solution that works, but also to write about their thought process and explain their thinking. IVA's math teacher's role is to lead students to discover patterns and formulas in the topics being explored. Students are given the space and encouragement to make conjectures, find counterexamples, and discuss other perspectives. Mental engagement and discussion is encouraged over note-taking. The aim is for students to develop a deep understanding of the topics through engagement, rather than writing down steps to memorize later. Through practice, writing, deep thinking and problem-solving, students grow not only in the intellectual virtues, but also toward demonstrating mastery of Common Core State Standards in mathematics. Sometimes is it hard to imagine what a math classroom might look like that has such a mixture of deep conceptual understanding and practice. See our video, Math in a Minute at IVA, to step inside the classroom. IVA's science curriculum, It’s About Time Project-Based Inquiry Science, carefully leads students to a deep understanding of science topics. Lessons begin with a lab, where students actively explore the topics through hands-on experiments or demonstrations before reading the text. An important component of the curriculum is writing explanations: students are presented with a question to explore in each lesson and each unit. Students make a claim about the question and support the claim with science knowledge, from the text, evidence from experiments, or personal experience. Students take on real-life issues -- planning erosion control around a basketball court or writing a proposal for a potential asteroid strike on Earth. This hands-on program draws students into the material and gives them the opportunity to explore the topics on their own, creating interest in the text, which also becomes more meaningful as they seek additional information. Home thinking might include 2 assignments a week that allow students to think autonomously through the days lesson or to prepare for the next class. The HoT will be in the form of a short activity or reading followed by a writing reflection. Students will also work on their science fair project at home throughout the year by carrying out a procedure, analyzing their data, and putting together their display. Novels make up the bulk of what students read, discuss, analyze, and write about in Literature and Composition (LitComp) classes at IVA. Guided by the teacher, students engage in activities and thinking routines to explore each novel. These thinking routines serve as a launching point for discussion, when students share their ideas with partners as well as the whole class. The teacher creates frequent opportunities for students to ask meaningful questions and seek thorough and thoughtful answers to questions in the novel. Students, encouraged by the teacher and IVA's classroom culture, offer comments, observations, and wonderings – habits they come quickly to enjoy and take pride in. Through the novel, students in IVA LitComp classes have explored themes such as what it means to be human, how race and racism can affect a community, the meaning and value of friendship, how an adventure can change you, what makes beautiful language beautiful. The Dream Keeper and Other Poems by Langston Hughes. Much, but not all, of classroom language and grammar development is based on Sentence Composing for Middle Schoolers by Don Killgallon and Sentence Combining by William Strong. Students learn to be better writers by studying good writing. Students analyze excerpts of sentences taken from well-written classic and current novels, break the sentences down into meaningful parts, then write ones of their own imitating the styles they see in the book. Over time and with this practice students grow into their own voice and style. Through deep and practiced analysis of novels and the elements of strong writing, IVA's students can expect to be able to demonstrate all the English Language Arts skills in the Common Core State Standards. Home thinking is primarily reading from the current novels. Students will be encouraged to read a certain number of chapters each week and think about/write down one question and one concept or connection. In order to think like historians and social scientists students will be encouraged to continually practice all of the intellectual virtues during various points throughout the year. The Intellectual Virtues share in an important partnership with historical study and ultimately form the basis of what it means to think like a historian and social scientist. Understanding different interpretations, analyzing challenging texts, and asking provocative questions requires a growth mindset that can be traced directly back to each master virtue. Class discussions, activities, and thinking routines will require students to push their thinking, practice open-mindedness, and form strong connections. Historical projects and writings will further provide students the opportunity to think carefully and critically about what evidence to include, what to exclude, and how to frame a concise argument about the past. These types of assessments will require students to practice intellectual attentiveness, intellectual carefulness, and intellectual thoroughness. Although students are not separately assessed on the virtues, the practice and awareness of them help to continually develop the personal qualities of an exceptional thinker and learner. Therefore, such virtues as curiosity, intellectual humility, intellectual courage, and intellectual tenacity will also be practiced in the IVA History classroom to further encourage students to embrace and overcome intellectual challenges and struggle. Students will be using the History Alive! textbook created by the Teacher’s Curriculum Institute as a basic framework for content information. However, this book is meant as a curriculum guide and will only serve as one source from students to learn. Throughout the year students will explore, discuss, and analyze secondary sources, primary sources, maps, data, and visuals in a meaningful way by utilizing thinking routines. These thinking routines are tools that will promote a deep understanding and questioning of the content. It is through the different sources presented to them and the daily practice of thinking routines that students will explore the unit-aligned essential questions and the daily Central Historical Questions. The subject matter of historical study is immense, encompassing all of human affairs in the recorded past. Historians must rely on the fragmentary records that survive from a given time period in order to develop as much of a full picture as they can. In order to help do this, historians create questions to frame the inquiry at hand, a practice occurring in this class as well. Students will use effective questioning methods in order to study the past and form their own inquiry-based arguments. While an initial place to start, these essential questions may change or be added to as new authentic lines of inquiry arise through class discussions and activities. IVA students learn Physical Education through a Teaching Games for Understanding approach. Under TGfU, students take part in different categories of activities that encourage movement, engagement, and thoughtful applications of skills and strategies. Each year of physical education focuses and builds students in their development of a greater understanding of strategies and skills as they make their way through cooperative activities, individual and dual activities, and sport-focused activities. Each lesson and activity is designed to develop students’ physical and cognitive abilities and challenge students’ understanding towards themselves as thinkers and movers. Students are also challenged in their application and understanding of health-related physical fitness skills and concepts. Daily activities push students to practice autonomy and tenacity in the way that they strive to achieve goals and learn how to apply principles that can allow them to become lifelong movers. The combination of health-related and skill-related physical fitness gives students an opportunity to develop a more holistic understanding of Physical Education. A variety of assignments are given to students throughout the year. Class learning assignments involve formative peer assessments and activities that require students to apply their knowledge of skills by giving feedback and using movements correctly. Home thinking assignments might include reflective journals and other tasks that will set up for and expand on thinking that is addressed during class time. Students will also be assigned 2-3 performance tasks per semester (individual and group) that will connect to the specific units that students are involved in and require students to demonstrate their knowledge and application of skills. Our Physical Education Curriculum is well summarized in one 8th grade students' end-of-unit Performance Task reflection: "In PE class we don't just exercise, we learn how to exercise, how to play games and think about the components that help us succeed in physical activity, the skills and strategies we learned while playing these games and thinking about these skills and strategy help us play more games and be more successful." Students in IVA Art classes will think deeply about how humans use art to communicate. IVA creates a meaningful approach to recognizing and understanding what and how artists communicate by offering an art-centered curriculum where students study examples of art throughout history and from many cultures. Students develop understanding by creating their own art, using and experimenting with the elements of art and design principals. For example, students look at artists who communicate through Geometric Art. Using thinking routines and classroom activities, they will create a working understanding of how artists communicated their ideas. Students then use attention to formal design to communicate their own ideas. In this way, they come to understand recognized artists and their work and also develop an open-mindedness about the nature of art and their own ability to act as artists. There is no textbook used in the art classroom. Rather, the California State Standards and Common Core State Standards are covered though curriculum designed with IVA’s mission and vision at the forefront. Art projects and the study of recognized artists act as a means to develop the students' creative communication and offer an opportunity for their own thoughtful response to the art of others. The Music class at IVA is a semester-long course designed to introduce students to music history, analysis, and vocal technique and performance. Students will think about how music has functioned historically (and functions today) in culture. They’ll begin learning music theory, with a goal of better understanding how composers communicate with performers. They’ll also be performers themselves; we’ll learn choral music together and talk about vocal technique and how we can sing well together. The goal is that students engage deeply in each unit’s specific topics and periods in music history, rather than attempting a broad and thus shallow overview of music history. Music asks us to grow in our Attentiveness—students will practice noticing and attending to detail and nuance, both when looking at music, and when listening to it. They’ll also pay attention to what they are doing with their bodies while singing, and how the whole class sounds singing together. The performance of music requires Intellectual Courage—students will need to persist in thinking, participating, and performing in spite of fear of embarrassment or failure. Opportunities to self-assess and reflect upon their performance let students focus on growth. Intellectual virtues are the personal qualities of a good thinker or learner. At IVA, we focus on promoting and fostering nine master virtues: curiosity, intellectual humility, intellectual autonomy, attentiveness, intellectual carefulness, intellectual thoroughness, open-mindedness, intellectual courage, and intellectual perseverance. These virtues fall into three categories, corresponding to three stages or dimensions of learning: getting the learning process started and headed in the right direction; making the learning process go well; and overcoming challenges to productive learning. 1. Curiosity: a disposition to wonder, ponder, and ask why. A thirst for understanding and a desire to explore. Slogan: Ask questions! 2. Intellectual humility: a willingness to own up to one’s intellectual limitations and mistakes. Unconcerned with intellectual status or prestige. Slogan: Admit what you don't know! 3. Intellectual autonomy: a capacity for active, self-directed thinking. An ability to think and reason for oneself. Slogan: Think for yourself! 4. Attentiveness: a readiness to be “personally present” in the learning process. Keeps distractions at bay. Strives to be mindful and engaged. Slogan: Look and listen! 5. Intellectual carefulness: a disposition to notice and avoid intellectual pitfalls and mistakes. Strives for accuracy. Slogan: Avoid errors! 6. Intellectual thoroughness: a disposition to seek and provide explanations. Unsatisfied with mere appearances or easy answers. Probes for deeper meaning and understanding. Slogan: Go deep! 7. Open-mindedness: an ability to think outside the box. Gives a fair and honest hearing to competing perspectives. Slogan: Think outside the box! 8. Intellectual courage: a readiness to persist in thinking or communicating in the face of fear, including fear of embarrassment or failure. Slogan: Take risks! 9. Intellectual tenacity: a willingness to embrace intellectual challenge and struggle. Keeps its “eyes on the prize” and doesn’t give up. Slogan: Embrace struggle! Please contact us if you are unable to purchase clothing within the dress code. IVA connects families in need with community resources. 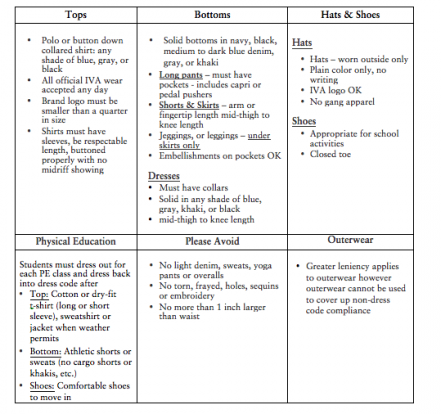 Families - we appreciate all dress code donations to help us provide students with dress code appropriate clothing. Common sense guidelines for dressing modestly apply. Free dress days are assigned at the discretion of the principal. Dress Code updated October 20, 2017. IVA Spirit Wear is coordinated by the PTA. Purchasing windows will be announced soon! Science: one college-ruled spiral notebook with full size storage pockets. Math/Social Science/Creative Exploration/Physical Education: college-ruled loose leaf paper in a binder with dividers OR multiple-subject spiral notebook with full size storage pockets. IVA students receive a locker on the first day of school and are encouraged to hold their PE clothes, an extra set of dress clothes, and supplies in their locker. Personal Planner: In the past our PTSA has provided planners but in our annual school surveys of students and parents less than 30% of families found the planner useful, especially given that most tracking of assignments is conducted online. Therefore, to utilize PTSA funds for other activities, IVA PTSA will not be provide student planners but encourages families to pick up a planner if you plan on its use. Required dress for any school event is in line with our regular dress code and requires a level of attire to fit the occasion. For events such as dances and promotion, please see below for general and more specific guidance. Please check with the office for further clarification. Example: Promotion Dress: Casual, comfortable dress attire that falls within the school dress code. The 8th Grade Promotion Ceremony event is intended to be a semi-formal event that requires a level of attire that fits the occasion. Ladies: Fingertip length skirt or dress, blouse/formal top (shoulders covered), dress pants, dress shoes (comfortable/easy to walk in, no greater than 2" heels). Gentlemen: Dress pants (nicer than jeans), long-sleeve button up shirt, dress shoes. Intellectual Virtues Academy has adopted the following general guidelines in order to enhance student achievement, create a safe learning environment, provide a spirit of school pride, and so that the school can operate free from distraction, hazard, or threat to students' health, safety, and general welfare. IVA tracks student infractions in a few areas: being out of dress code, use of cell phone on campus, tardies to class during the school day, disruptions at our full school Virtue ceremony or assemblies, and other types of harm to campus incidents. 3) email home about third infraction, which may result in any of the following: loss of school activity, cell phone contract, parent conference. Student behavior at IVA is based on positive support and involves multiple facets of support that include school staff, teachers, parents, and students. At IVA, student behavior support and discipline is as an important opportunity to encourage thinking habits in our students so that they can learn from mistakes and understand appropriate behavior as well as the consequences for our actions. At Orientation, our students will be presented with the Student Handbook, which outlines our community expectations that can be summarized in this idea: everything we do should support thinking and learning. Please note - IVA's focus on learning opportunities should not be mistaken for an unresponsive discipline process. IVA is responsive to individual behavior concerns as well as committed to helping students process the sort of conflicts that are normal at this stage in their lives. When negative behavior crosses the line of safety on campus we utilize our thorough Suspension and Expulsion Policy that is aligned with state and federal expulsion laws. One element of our discipline process is to hold Restorative Conversations, which are adopted from restorative practices. Please see our handout below to learn more. It is our goal to create the most positive, least disruptive learning environment for our students. We serve middle school students and this age brings with it all the complications of growth and development, this is a tough time in the lives of kids. The combination of the age of our students and our role as a public school to serve all students means that we cannot promise an environment free from disruptions but we can commit to minimizing the seriousness and frequency of disruptions caused by student misbehavior through our school's policies. In order to prioritize learning at IVA, we take very seriously any distraction that might stop our students from being provided a positive learning environment. It is a part of our model of education to capitalize as best we can on mistakes, failures, struggles, and other "disruptions" as, potentially, teachable moments. Students will receive their schedule of classes on the first day of school. The day before school begins you may view your schedule by logging into your Illuminate account at ivalongbeach.illuminatehc.com. To see the second semester classes you must change the date int the control panel. Rotating Thursdays - We see 2 classes a week on Thursdays. These classes rotate every three weeks. Week 1 = Block 1 & 2, Week 2 = Block 3 & 4, Week 3 = Block 5 & 6. The IVA Academic Calendar is 175 days of instruction, using curriculum and pacing that support a culture of thinking. Teachers will have 5 Faculty Academy days where students do not attend. These days are opportunities for our staff to think, alone and together, about each student's work and progress toward goals. As we take this time for thoughtful evaluation, we ensure that our students are offered the most rigorous, yet personalized, instruction. Faculty Academy Days days are scheduled for the day before school starts, after the first month of classes, at the end of the fall semester, halfway through the spring semester, and after the last day of the school year. Because we are committed to providing an excellent education for all students, our staff also works to continually develop our own growth in intellectual virtues, so that we may model the sort of thinking and learning that creates the desire to always want to know more. IVA is the first school to be founded on the principles of intellectual character growth, and our calendar reflects our commitment to IVA's mission.